Anthony Iapoce, the current special assistant to Chicago Cubs general manager Jed Hoyer, returned to his Queens roots in a major league uniform just prior to the All-Star break at Citi Field. 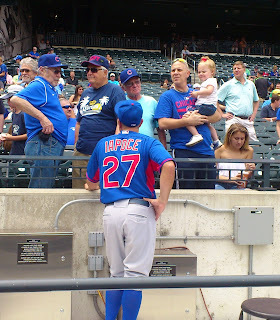 Iapoce was in the dugout sporting a major league uniform to keep an eye on the Cubs prospect rich lineup that included Kris Bryant, Addison Russell, and Jorge Soler. The 1991 Monsignor McClancy graduate and Hall of Famer took a few minutes to sit down with me to discuss his current role with the Cubs and what it meant for him to be on the major league field so close to where he grew up.